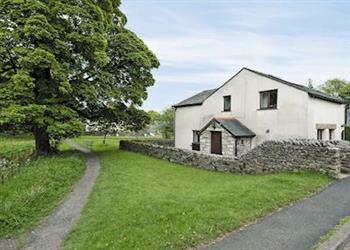 Beckside Cottage in Orton, near Appleby sleeps 6 people. Beckside Cottage near Appleby is situated in the rural village of Orton and has been beautifully furnished throughout. Solar panels provide hot water, and there is a well-appointed breakfast kitchen and spacious bedrooms which have great views. Much thought, care and attention have gone into the finer details, ensuring that visitors will enjoy a restful holiday. Beckside Cottage near Appleby is a detached cottage which lies adjacent to a green and a beck, complete with paddling ducks, which runs past the back of the owner’s property. With quiet roads and footpaths lined with wild flowers, this makes a wonderful base from which to explore the majestic beauty of the Lake District National Park. The interesting old market town of Appleby is 8 miles, and Kendal is within a 15-mile drive. The Yorkshire Dales, the Coast-to-Coast Walk and the Cumbrian Cycle Way are all easily accessible. Ullswater and Windermere lakes are both within 23 miles. The shop and Post Office is 300 yards, With a pub/restaurant 200 yards from Beckside Cottage near Appleby. Ground Floor: Beckside Cottage has 3 steps to entrance. Living/dining room: With wood burner, Freesat TV and DVD player. Kitchen: With breakfast area, electric oven, electric hob, microwave, fridge, freezer and dishwasher. First Floor: Bedroom 1: With zip and link super king-size bed (can be twin beds on request) and en-suite with shower cubicle and toilet. Oil underfloor heating, electricity, bed linen, towels and Wi-Fi included. Initial logs for wood burner included. Highchair available on request at cost. Welcome pack. Enclosed patio area with garden furniture. On road parking. No smoking. Please note: There is a small beck beyond the wall, 3 yards away. Holidays at Beckside Cottage run from Friday to Friday. Do you want to holiday near Beckside Cottage (UK1024), you can see other cottages within 25 miles of Beckside Cottage; have a look to find your perfect holiday location.